Etymotic ER20-SMB-C Hi-Fidelity Musicians Ear Plugs (Standard Size Clear Stem Only) - Includes 1 Pair With Carry Case, Instructions, and Neck Cord. Fits Average to Small Ear Canals. Note: Etymotic has changed the size designation. 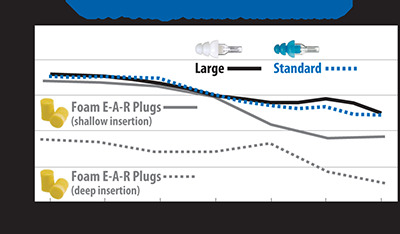 The regular size is now called "Large" and the BabyBlues Small is now called "Standard"
ER-20 Hi-Fi Ear Plugs reduce the volume by about 20 db--just enough to prevent damage to your hearing, but not so much that you lose the enjoyment of the music. The ER-20 has an NRR of 12 rather than 20 because the frequency weighting used in the NRR calculation assumes blocking of higher frequencies more than of lower frequencies, and these plugs do not do that. They are designed to let you hear the full range of music, without distortion across the frequencies. ER-20 plugs are durable, washable, and long lasting. With proper care they will last for months even with daily use. Sold with sturdy carrying cases in quantities of one or more. The more you buy, the more you save. All packs include a carrying case with each pair of plugs. Removable Neck Cord for ER-20 Musician Ear Plugs. Fits Large, Standard and Baby Blues Model ER-20 Ear Plugs. Etymotic Ety-Plugs Hi-Fi Musicians Ear Plugs - Standard Size (Blue or Frost Tip)5DebMarch 4, 2018I'm no musician for sure, but I go to the gym 6 days a weeks for group classes. Instructors blast the music to get us all pumped up. I was looking for something that would still let me hear the instructor and the music. The Natural hearing comes clearly through and doesn't effect my workouts. I've had these for a couple of months now, I couldn't be happier. I plan on getting more so that both my husband and I can wear them during concerts. They are so easy to put in my ears and remove them. They fit perfect! Totally love them! Etymotic Ety-Plugs Hi-Fi Musicians Ear Plugs - Standard Size (Blue or Frost Tip)5KennyFebruary 22, 2018I've had 15 pair of these things. I take them everywhere. They're comfortable, convenient and allow me to enter loud places with ease. IF you have hearing sensitivity, these will bring the room down just enough so that you can be comfortable inside, and hear people talking close by without having to shout. Etymotic Ety-Plugs Hi-Fi Musicians Ear Plugs - Standard Size (Blue or Frost Tip)5Lori FunkJune 26, 2017My husband's doctor advised him to wear ER20, musicians ear plugs when we go to concerts to protect his hearing from any further damaged. He was surprised how great the music and band sounded. He is very happy with them. Etymotic Ety-Plugs Hi-Fi Musicians Ear Plugs - Standard Size (Blue or Frost Tip)5bpbFebruary 23, 2017I have intermittent tinnitus in one ear which can be exacerbated by loud sound, even music. These plugs are great as they allow high fidelity sound through while simultaneously attenuating the volume. They have helped me enjoy concerts without compromising the experience and while largely preventing ringing in my ears afterwards. Etymotic Ety-Plugs Hi-Fi Musicians Ear Plugs - Standard Size (Blue or Frost Tip)5KisaNovember 27, 2015Finally an ear plug that fits my ears! My son is a musician and plays at very loud venues. The design of the ear plugs allowed me to appreciate the quality of the sound without the deafening noise. I've used other ear plugs but they don't fit well and I still leave with ringing in my ears. I immediately bought 3 more pairs for my family members. Etymotic Ety-Plugs Hi-Fi Musicians Ear Plugs - Standard Size (Blue or Frost Tip)5CarloAugust 21, 2015For the price, they work exactly the same as some of those $40 hi-fi earplugs. I'm a drummer and I use them all the time for gigs and practice. My wife love hearing me play drums, but going to live performances can be overwhelming because the venue amplification systems are usually just overwhelming. These work perfectly for her. Etymotic Ety-Plugs Hi-Fi Musicians Ear Plugs - Standard Size (Blue or Frost Tip)5JessApril 13, 2015I use these at concerts quite frequently. I keep them in my car so that I don't forget and clean them off in the bathroom when the show ends. They block noise enough so that I can hear the next day but not enough that I can't hear the show well. Etymotic Ety-Plugs Hi-Fi Musicians Ear Plugs - Standard Size (Blue or Frost Tip)5Scott TFebruary 15, 2015Reasonably priced plugs which are perfect for motorcycle riding. They block the most offensive wind and road noise while allowing music and calls through with clarity. Other noise such as horns are also easier to hear. Definitely worth 12 bucks. Etymotic Ety-Plugs Hi-Fi Musicians Ear Plugs - Standard Size (Blue or Frost Tip)4Lisa SciubbaJanuary 29, 2015Recommended by my audiologist after test results showed mild noise induced hearing loss (mostly left ear, likely due to violin playing). Sound quality is decent with them in, as compared to cheap foam plugs which make everything sound dead. Seal can break and have to be put back in if environment is warm and I'm sweating, or if I stop for a drink (jaw movement). Overall, a very acceptable way to prevent additional damage and permit me to continue playing. Etymotic Ety-Plugs Hi-Fi Musicians Ear Plugs - Standard Size (Blue or Frost Tip)5TrixieMomJanuary 3, 2015I bought both sizes for my entire family to wear at concerts and when in noisy environments. These were recommended to me by a friend who attends concerts frequently. Since hearing loss is cumulative over a lifetime, I am happy to prevent hearing loss with the use of these earplugs in both sizes! Etymotic Ety-Plugs Hi-Fi Musicians Ear Plugs - Standard Size (Blue or Frost Tip)5Roberta SerpeNovember 14, 2014I bought these ear plugs for my 16 year old son who plays guitar in a band. They were recommended by an audiologist where I work. She suggested trying these before spending $150 on the custom plugs she could make for him. He is thrilled with them! He can still hear everything clearly but the volume is greatly reduced. I am thrilled because the plugs are saving his hearing while saving me some money! Etymotic Ety-Plugs Hi-Fi Musicians Ear Plugs - Standard Size (Blue or Frost Tip)5ChrisSeptember 29, 2014I already had these from another supplier but they only sold the large and they're nearly 2 years old. I wear them riding a motorcycle with a modular helmet. I ordered TWO pair of these, the standard size from Earplug Superstore. They're even more comfortable than the large I've been wearing for two years. The second pair was for my wife to finally get her to wear hearing protection too. She too was amazed at the comfort and that she could still conversation. I have to turn the intercom on the bike up but not much at all. I've tried the "mold yourself" ones and had to turn my intercom up so much it distorted the sound. These plugs protect you from wind noise much better than the mold yourself ones. There's even brochures for these plugs in my Audiologist's office! Etymotic Ety-Plugs Hi-Fi Musicians Ear Plugs - Standard Size (Blue or Frost Tip)3BeverlyAugust 29, 2014Very comfortable and good fit. Didn't block as much sound as I would have liked. I have very sensitive hearing because of migraine. Would probably be ok for the average person. Very good quality. Etymotic Ety-Plugs Hi-Fi Musicians Ear Plugs - Standard Size (Blue or Frost Tip)5NeilMarch 27, 2014A bit big for the ear with some lateral pain, but no tinitus following front row seating at a recent concert. I didn't miss a note, either. Etymotic Ety-Plugs Hi-Fi Musicians Ear Plugs - Standard Size (Blue or Frost Tip)5Tana ShirkFebruary 24, 2014Wonderful! Etymotic Ety-Plugs Hi-Fi Musicians Ear Plugs - Standard Size (Blue or Frost Tip)5KevinOctober 17, 2013Use these at work to help reduce surrounding machinery and loud noise. But I can still hear voices clearly. Etymotic Ety-Plugs Hi-Fi Musicians Ear Plugs - Standard Size (Blue or Frost Tip)4Sammy BurnhamOctober 7, 2013I ordered the "blues" because I wear a medium ear plug in the military- these plugs were not as snug as I would like but seem to work very well. They stayed in place and are comfortable. All in all well worth the money. I could still hear everything and at the end of the performance I removed them and did not have the continual roar that normally follows a loud on stage performance of a full band. Etymotic Ety-Plugs Hi-Fi Musicians Ear Plugs - Standard Size (Blue or Frost Tip)5KayAugust 4, 2013These allow me to hear singers & the rest of the pit, while protecting me from the trumpet & trombone behind me. Etymotic Ety-Plugs Hi-Fi Musicians Ear Plugs - Standard Size (Blue or Frost Tip)5DRMay 20, 2013I bought these to wear during hip-hop dance-fitness class, where people like to FEEL the bass. And scream. The volume can get a little painful. I was wearing disposable foam plugs, but the sound was muddy and dull and I couldn't carry on a conversation with them in. With these, the music still sounds plenty loud, and clear enough to get my groove on. My ears used to ring for about 20 minutes after class, and now they don't. After a little practice, I can now insert them comfortably enough that I forgot they were in until I was ready to drive home. Etymotic Ety-Plugs Hi-Fi Musicians Ear Plugs - Standard Size (Blue or Frost Tip)5G.G.April 26, 2013I've been using this model earplug for the last couple of years. I have Hyperacusis from head trauma in an accident. They are the only ones I've found that lower the level of sound to make normal life bearable sound-wise, yet without distorting the sound. I wear this brand/model daily and I'm truly thankful for them. Etymotic Ety-Plugs Hi-Fi Musicians Ear Plugs - Standard Size (Blue or Frost Tip)3AlanApril 9, 2013It helped lower the sound of a concert I was at, to a comfortable level. I had no ringing in my ears after(which i always had without the Ear Plugs). I find that it tends to take away a fair amount of details in the music. But what can you expect for such a cheap price. Etymotic Ety-Plugs Hi-Fi Musicians Ear Plugs - Standard Size (Blue or Frost Tip)5Sean DuffyApril 2, 2013These are excellent for concerts. Keep them clean and dry for best results. Etymotic Ety-Plugs Hi-Fi Musicians Ear Plugs - Standard Size (Blue or Frost Tip)4IvanJanuary 20, 2013So far it does pretty well. I haven't taken it out to the clubs yet. I did however test them by cranking my guitar amp all the way up and putting my head right up close to the amp. It works beautifully. Then I was able to have a normal conversation with them still on. This received a 4 out of 5 because it was a little too big for my ear, but if I pushed it in hard enough it sits in quite well. Etymotic Ety-Plugs Hi-Fi Musicians Ear Plugs - Standard Size (Blue or Frost Tip)2DaleNovember 1, 2012The earplugs are a little bit tight in my ears so not very comfortable. Even though I'm a male and 6' tall, my ear canals are apparently a little smallish. The other thing I didn't like about them was the hard plastic stems -- they didn't allow the earplugs to collapse enough so it added to the tightness I was feeling when the earplugs were inserted. You need the plastic stems if you will be using the neck cord but I pulled the stems off and then installed MusicSafe filters into the Etymotic earplugs. That made them more comfortable but still not ideal for me. If I find someone with larger ear canals and who wants earplugs, they might be just fine for them. When I ordered these Etymotic ER20 Standard Size earplugs, I also ordered MusicSafe Pro earplugs. Even though the MusicSafe are bigger when not inserted, they actually fit better and are more comfortable because they are softer and don't have the firm bulgey tip that the Etymotic's have. By design, I think the MusicSafe will fit a wider range of ears since they are larger in diameter but softer. Etymotic Ety-Plugs Hi-Fi Musicians Ear Plugs - Standard Size (Blue or Frost Tip)5Rodger CottonOctober 25, 2012I play the Bagpipe, and these plugs are my favorite. I can hear my instrument BETTER while Tuning, and in noisy environments (crowded Pubs for example) I can hear my instrument better, and the other PIpers around me. Etymotic Ety-Plugs Hi-Fi Musicians Ear Plugs - Standard Size (Blue or Frost Tip)5Cassandra GienappOctober 12, 2012Went to a concert last night no ringing in my ears today. They fit great too. Etymotic Ety-Plugs Hi-Fi Musicians Ear Plugs - Standard Size (Blue or Frost Tip)5Frazier ShefferSeptember 28, 2012The sound pressure levels at most theaters these days is hazardous to your hearing. These ear plugs work very well at attenuating the volume across the entire audio spectrum without adversely altering the dynamics. Problem solved! Etymotic Ety-Plugs Hi-Fi Musicians Ear Plugs - Standard Size (Blue or Frost Tip)5Sam FarrisAugust 16, 2012These work great for me! I will probably buy one set foe each guitar and bass case as I am prone to misplacing things. Give em a try for yourself and save your hearing while you still have it! Etymotic Ety-Plugs Hi-Fi Musicians Ear Plugs - Standard Size (Blue or Frost Tip)5RobAugust 7, 2012I wore these at a Bush and Nickleback very loud rock concert. They do block the sound but are not much different than any other plugs I have worn. You still miss out on the highs and lows, and strangely my ears rang after the concert? Will try them one more time at the next concert. Etymotic Ety-Plugs Hi-Fi Musicians Ear Plugs - Standard Size (Blue or Frost Tip)5alexaJune 28, 2012GREAT!!! Etymotic Ety-Plugs Hi-Fi Musicians Ear Plugs - Standard Size (Blue or Frost Tip)5BradJune 11, 2012I wear one of these in my left ear when I play the violin and viola; it reduces the volume perfectly while allowing the music to be clearly heard. I also wear a pair when driving thirty miles each way to work in my older car, as they greatly reduce the road noise and allow me to hear the radio well. They are especially effective when it is raining, which adds to the din. Great product and highly recommended! Etymotic Ety-Plugs Hi-Fi Musicians Ear Plugs - Standard Size (Blue or Frost Tip)5LarryJune 10, 2012I have been wearing these on the motorcycle for several months now and they work great. They take just enough wind noise away to make the ride much more enjoyable. Etymotic Ety-Plugs Hi-Fi Musicians Ear Plugs - Standard Size (Blue or Frost Tip)5maxJune 8, 2012bought 1 pair, loved em. bought 2 more, one for my gal, and a spare. wanna try their ear buds, and eventually custom pro plugs. Etymotic Ety-Plugs Hi-Fi Musicians Ear Plugs - Standard Size (Blue or Frost Tip)5G.R.May 29, 2012Just bought two more sets, can't rave enough about them! I use them with my band all the time, my guitar cuts through loud and clear, without the damaging after effects. Highly recommended! Etymotic Ety-Plugs Hi-Fi Musicians Ear Plugs - Standard Size (Blue or Frost Tip)5D.L3907May 5, 2012I bought these earplugs and wore them to a Rammstein concert. They worked great! I was the only one in the group that didn't have ringing ears after the show. Definitely recommend these! Etymotic Ety-Plugs Hi-Fi Musicians Ear Plugs - Standard Size (Blue or Frost Tip)5R. E.April 22, 2012I bought these earplugs to use at a Van Halen concert. Have never used anything except foam disposables. They were worth every cent. Easy to carry in their case, easy to insert and adjust with a turn and pull/push. It didn't take long to know the music and the crowd were VERY loud, and these earplugs did exactly what they were supposed to do. Cut the decibles without affecting quality of sound. I can't speak highly enough of this purchase. Etymotic Ety-Plugs Hi-Fi Musicians Ear Plugs - Standard Size (Blue or Frost Tip)5DougatLafayetteApril 15, 2012We do cajun and zydeco dancing several times a week. Live music, amplified and beaucoup loud. These earplugs really filter out the noise, reduce the volume, yet let all the notes of the music through. Conversation in the music environment is also much easier to understand with the earplugs in. This order was extras for visiting friends. Etymotic Ety-Plugs Hi-Fi Musicians Ear Plugs - Standard Size (Blue or Frost Tip)5AndrewApril 14, 2012These are excellent musicians' plugs! They perform exactly as described by the manufacturer, turning down the volume without muddiness or other distortion of the sound. I play in two gigging bands and use these for both rehearsals and performance, as well as when doing sound and lighting for other groups. I've even given these as gifts to concert-goers, other musicians, and techs. I'm back to this site for a third round of purchasing! Very happy repeat customer. Etymotic Ety-Plugs Hi-Fi Musicians Ear Plugs - Standard Size (Blue or Frost Tip)5HelenApril 13, 2012LOVE EM! Etymotic Ety-Plugs Hi-Fi Musicians Ear Plugs - Standard Size (Blue or Frost Tip)5gmanzerApril 2, 2012These worked great! Went to a Van Halen concert and we were 18 rows from center stage. Left with our hearing intack and still were able to to enjoy all the music without any distortion. Would highly recomend this item. Etymotic Ety-Plugs Hi-Fi Musicians Ear Plugs - Standard Size (Blue or Frost Tip)5LarryMarch 28, 2012I purchased 1 set for my wife and I about a month ago. After several times and many miles they are our 1st choice for earplugs. they are comfortable and take the edge off the wind noise perfectly. I have since ordered 6 more pairs and several of my fellow riders are now wearing them to. Great product! Etymotic Ety-Plugs Hi-Fi Musicians Ear Plugs - Standard Size (Blue or Frost Tip)5ChanceMarch 19, 2012I was pleased with product, but as a layman, I could have used more descriptive info such as % of overall volume reduction in addition to decibels. Etymotic Ety-Plugs Hi-Fi Musicians Ear Plugs - Standard Size (Blue or Frost Tip)5ChrisFebruary 21, 2012Very happy with this product, works wonderfully and for a great price too. Would highly recommend. Etymotic Ety-Plugs Hi-Fi Musicians Ear Plugs - Standard Size (Blue or Frost Tip)5MichelleFebruary 14, 2012I see a lot of live music and was tired of the ringing in my ears the day after a show. I have not had any problems since I started wearing the Etymotics. These ear plugs are convenient to carry with you and they easily adjust for more or less sound protection as you need it. I have a smaller ear canal (based on my ipod earbud sizing) and the baby blues are a perfect fit for me. I have purchased many pairs of these as I always end up giving an extra pair to a friend at shows. These are a great buy! Etymotic Ety-Plugs Hi-Fi Musicians Ear Plugs - Standard Size (Blue or Frost Tip)5AllenJanuary 11, 2012I already suffered from tinnitus before I purchased these earplugs, and, since I am still a musician needed something to help protect against further damage to my ears. These plugs worked!! Enough protection without blocking out the music completely. They're great! Etymotic Ety-Plugs Hi-Fi Musicians Ear Plugs - Standard Size (Blue or Frost Tip)5PennyJanuary 6, 2012Easy to insert and make a comfortable seal without trying. Aids conversations in noisy settings (planes, public areas) while making painfully loud situations bearable (concerts, outdoor events). Strongly recommended. Etymotic Ety-Plugs Hi-Fi Musicians Ear Plugs - Standard Size (Blue or Frost Tip)5BruceNovember 30, 2011Excellent product. I've used the more-expensive Alpine MusicSafePro plugs; I like these better. While they don't reduce decibels as well as the Alpines, they do afford a better, clearer listening experience, and work well enough to prevent that ringing that can sometimes last a day or two. Of course, if you're going to sit right in front of the speakers for a really loud show, your results may be different! I also like that I can purchase based on my ear canal size. Etymotic Ety-Plugs Hi-Fi Musicians Ear Plugs - Standard Size (Blue or Frost Tip)5Madison W.November 12, 2011These work great at live gigs. Comfortable and effective. Etymotic Ety-Plugs Hi-Fi Musicians Ear Plugs - Standard Size (Blue or Frost Tip)5AdrianOctober 26, 2011Very nice, *fit in my ear snug. *Comfortable Great noise cancellation, my roommate is in a separate room, likes to play music loudly, with these the music is cancelled out, and I can actually concentrate elsewhere. Etymotic Ety-Plugs Hi-Fi Musicians Ear Plugs - Standard Size (Blue or Frost Tip)5Russell SlyeOctober 25, 2011The earplugs worked very well and allowed me to enjoy the very loud music without degrading the sound. Etymotic Ety-Plugs Hi-Fi Musicians Ear Plugs - Standard Size (Blue or Frost Tip)5Bagpiper1October 22, 2011These plugs are great. Very comfortable, convenient little case and work as advertised. I play the bagpipes and appreciate the way these plugs limit the extremes of volume while still allowing me to clearly hear and enjoy the music. Definitely worth the few extra bucks compared to foam plugs, which are great for a jobsite but not someone enjoying music. Etymotic Ety-Plugs Hi-Fi Musicians Ear Plugs - Standard Size (Blue or Frost Tip)5CarloOctober 10, 2011Pretty much the same design and quality as the E.A.R Hi-Fi earplugs but at a substantially lower price! Etymotic Ety-Plugs Hi-Fi Musicians Ear Plugs - Standard Size (Blue or Frost Tip)5BudOctober 9, 2011Fits my ear perfectly and comfortable. The plug does what it is advertised to do and i really like them. Certainly will protect your hearing. Etymotic Ety-Plugs Hi-Fi Musicians Ear Plugs - Standard Size (Blue or Frost Tip)5jdOctober 4, 2011We went to a rock concert last night and came out with absolutely no ringing!! Also, I could hear conversations during the act, and still also hear the music. Further, my cilia are bent from a car accident, and the earplugs kept me from having pain or headaches from the loud noise. These are phenomenal, and I am going to get more for other family members. Etymotic Ety-Plugs Hi-Fi Musicians Ear Plugs - Standard Size (Blue or Frost Tip)5Glenn HarmsSeptember 21, 2011The service was very fast and the Ear Plugs are good quality. Etymotic Ety-Plugs Hi-Fi Musicians Ear Plugs - Standard Size (Blue or Frost Tip)5ErnieSeptember 20, 2011They are great! Previously I wore off-the -shelf silicon putty earplugs, which work fine, except that they do cut off more hearing in the speech range, and high frequencies. WIth these ER20s, you can still hear lyrics to songs, and hear people talking. THe only drawback is that everyone will see the plugs protruding from your ears. This may be a reason to splurge for the more expensive, custom in-ear plugs. But then you are paying around $200! Etymotic Ety-Plugs Hi-Fi Musicians Ear Plugs - Standard Size (Blue or Frost Tip)5JGSeptember 19, 2011Wore this at several shows. Just enough so my head isn't pounding the following day. Sound was still clear just enough to muffle a bit. Love that they are washable and resusable. Etymotic Ety-Plugs Hi-Fi Musicians Ear Plugs - Standard Size (Blue or Frost Tip)5BassplrAugust 16, 2011I have been wearing shooters plugs for decades except when performing. I bought a set of these and am using them for everything. I gave a set to my drummer, he was so pleased he is buying a set for his brother the guitar player. They do not get in the way of singing and are a comfort to wear. Best set I have ever bought. Etymotic Ety-Plugs Hi-Fi Musicians Ear Plugs - Standard Size (Blue or Frost Tip)4NyssaAugust 16, 2011This product was great at reducing the overall noise level while preserving the music quality. However if you're next to the speakers it doesn't do much for a heavy and low bass, which ends up drowning out much if the other tones. Overall I was satisfied though. Etymotic Ety-Plugs Hi-Fi Musicians Ear Plugs - Standard Size (Blue or Frost Tip)5KatherineJuly 20, 2011I love these earplugs! I got 3 pair and have already given a pair away! They work wonderfully at reducing the decibel level while still being able to hear music and people clearly! Etymotic Ety-Plugs Hi-Fi Musicians Ear Plugs - Standard Size (Blue or Frost Tip)5jeremyJuly 19, 2011These were great! I opened the package, put them in my ears and heard my drums as they sounded, just at a bearable level. The NRR of 12 confused me a bit, but they do reduce the volume as much as they say, like 20dB. I would recommend. Getting them to fit comfortably is really easy enough after the first few times. If you like wearing plugs but hate the muffle - get these. Heck get one for everyone you know who should have them! Etymotic Ety-Plugs Hi-Fi Musicians Ear Plugs - Standard Size (Blue or Frost Tip)5Tim DuffJuly 18, 2011Excellent product! Worked like they said with no ringing in the ears or ear fatigue. Etymotic Ety-Plugs Hi-Fi Musicians Ear Plugs - Standard Size (Blue or Frost Tip)5NancyJuly 5, 2011Bought these for my husband. It was very loud and he felt they worked well --glad he had them. He could hear those around him talking, too. They were so comfortable he almost thought they had dropped out. Thanks! Etymotic Ety-Plugs Hi-Fi Musicians Ear Plugs - Standard Size (Blue or Frost Tip)5G-MANJune 19, 2011Very nice ear plugs/noise filters, comfortable, they do keep a decent amount of noise/distortion out, while allowing the music to come through and still hear my guitar as well as the rest of the band. Would definitely buy another pair. Etymotic Ety-Plugs Hi-Fi Musicians Ear Plugs - Standard Size (Blue or Frost Tip)4AdamJune 6, 2011I've just got a second set of these for my mom. She used to have problems at concerts and ear filters have greatly helped solve a lot of the problem for her. Her original set of ety20s came with options of colored stems, I got a set in blue, but I'm glad to see now the stem is fully clear. Makes it less obvious you've got something in your ear at concerts. She raves about these things so much after the show, it's great to walk out of a 3 hour show and pull these out, not have any ringing, not have to be shouting. Etymotic Ety-Plugs Hi-Fi Musicians Ear Plugs - Standard Size (Blue or Frost Tip)4AugustMay 31, 2011These are amazing. They dont muffle the sound; just keep the really loud out. Only problem was that they make my ears itch. Maybe its just me. Idk. But it keeps me from wanting to wear them very long. Etymotic Ety-Plugs Hi-Fi Musicians Ear Plugs - Standard Size (Blue or Frost Tip)5Rene FourestieMay 18, 2011Those are the best ear plugs I have tried, I just ordered 5 more pairs, my entire band wants them. Etymotic Ety-Plugs Hi-Fi Musicians Ear Plugs - Standard Size (Blue or Frost Tip)4dimitrisMay 11, 2011Very guick response to my order; the earplugs are really good! Etymotic Ety-Plugs Hi-Fi Musicians Ear Plugs - Standard Size (Blue or Frost Tip)5MitchMay 4, 2011So glad I took a chance and bought them! Great product! Thank you! Etymotic Ety-Plugs Hi-Fi Musicians Ear Plugs - Standard Size (Blue or Frost Tip)5SteveApril 30, 2011I bought these for me and two of my young adult children for a concert. We all have slightly small ear canals, fwiw. I found the fit very comfortable. The quality of the music was very good, and better than without the plugs in. It seemed a bit clearer, less muddy. Most likely due to the non-flat attenuation curve, cutting more of the low frequencies. The amount of attenuation was adequate for a mildly loud concert which was uncomfortable without earplugs. For a real rip-roaring tear your head off kind of concert I would want more attenuation than these. Etymotic Ety-Plugs Hi-Fi Musicians Ear Plugs - Standard Size (Blue or Frost Tip)4JonathanApril 19, 2011I find the ear plugs to effectively lower the decibel level, but two things: 1. if you are 6' or taller and male, there's a good chance you'll need the larger version and 2. Although these are significantly better than a standard earplug, I find that the highs and mids are cut a little too much. Tuning becomes an issue especially for vocals and other variable pitch instruments. I'm not sure if there's a better way around this problem or not. They take some getting used to and are really optimal for louder high-volume circumstances. In other words, if the stage volume is on the edge of being a problem, you'll have a really hard time using these. Etymotic Ety-Plugs Hi-Fi Musicians Ear Plugs - Standard Size (Blue or Frost Tip)5Jon MurdockApril 18, 2011Am a drummer for a kickin' country band and use electronic drums with big speaker amps-ER-20s blew me away-I could hear the singer tell song and key and when the music started could hear everything- bass sounds the floor wedge that I can't hear I can hear now -a complete separation of sounds was so impressed bought the Band some too! And its no suprize they love them too and Oh yes reduced my ear ringing the reason I got them- try-em yourself . Etymotic Ety-Plugs Hi-Fi Musicians Ear Plugs - Standard Size (Blue or Frost Tip)5PJSApril 5, 2011Not only does the product work well (playing in a concert band in front of trumpets! ), but the customer service is the best. Etymotic Ety-Plugs Hi-Fi Musicians Ear Plugs - Standard Size (Blue or Frost Tip)4The CoelacanthApril 5, 2011Pretty good item. I work in a big box store, frequently running forklifts etc. with sirens and alarms. These plugs do a good job of reducing the higher pitches which I find quite painful at this point. Lower sounds don't experience quite as much attenuation, but that is what enables me to hear speech without difficulty. I am still getting used to them, they are a bit pricey, but do their job well and are comfortable. Etymotic Ety-Plugs Hi-Fi Musicians Ear Plugs - Standard Size (Blue or Frost Tip)5vid14March 14, 2011I have a brain injury, I use these ear plugs every time I go out in public (especially restaurants, movies, concerts, bars etc.) They do a fantastic job of blocking out background noise so I can better focus on the conversations I'm having. I LOVE these earplugs. I can wear them all day, and forget I'm wearing them! I highly recommend them to everyone. I've also tried both standard blues and frost tip... the frost tip are too large in my ears and my ears get sore after wearing them for only a few minutes. If you've never worn them, try the standard blues first, if those are too small try the white! Etymotic Ety-Plugs Hi-Fi Musicians Ear Plugs - Standard Size (Blue or Frost Tip)5AGMarch 8, 2011I carry these on my keychain so I'm always prepared. They work great at movies. They dull the painfully high frequencies so I can enjoy the movie! They're also great at concerts. Etymotic Ety-Plugs Hi-Fi Musicians Ear Plugs - Standard Size (Blue or Frost Tip)5IanMarch 3, 2011What more could you ask for. Etymotic Ety-Plugs Hi-Fi Musicians Ear Plugs - Standard Size (Blue or Frost Tip)3JFebruary 26, 2011I am a public school band director and use these earplugs during rehearsals. They are indeed better than foam earplugs as far as attenuation at the higher frequencies, but I would not say they are as effective as simply 'turning down the volume' like on a stereo. They are decent for the price, but next time I will look more carefully at the custom-fit, much more expensive earplugs for my needs. I would recommend these for the casual, non-audiophile user. Etymotic Ety-Plugs Hi-Fi Musicians Ear Plugs - Standard Size (Blue or Frost Tip)5MariaFebruary 7, 2011I bought these in advance of a metal concert in a large venue. The ear plugs were really great. I could still hear all the music and the loudness, but had no ear or head pain whatsoever, which I usually experience. Thank you! Etymotic Ety-Plugs Hi-Fi Musicians Ear Plugs - Standard Size (Blue or Frost Tip)5RadekJanuary 27, 2011They work really well. The little case that comes with them is nice. They are great for work (noisy environments) and concerts, racing events. Thanks! Etymotic Ety-Plugs Hi-Fi Musicians Ear Plugs - Standard Size (Blue or Frost Tip)5DaveJanuary 23, 2011I purchased my first pair three weeks ago and should have seeked them out sooner. I'm a working musician in my 50s and my hearing has gone downhill since my earily 20s. I was singing a bit flat at times and these plugs help me sing more on pitch. I can still hear the monitors and other instruments on stage all in Hi-Fi. I recommend these plugs highly! Etymotic Ety-Plugs Hi-Fi Musicians Ear Plugs - Standard Size (Blue or Frost Tip)5AndrewDecember 23, 2010I play regularly with two loud bands, and these plugs are life savers! The "Baby Blues" are perfect for bringing the stage volume down to a reasonable level while maintaining the frequency balance. I can still hear details without damaging my hearing! Etymotic Ety-Plugs Hi-Fi Musicians Ear Plugs - Standard Size (Blue or Frost Tip)5DanDecember 22, 2010Used at recent Garth Brooks Concert and performance of the ear plugs was outstanding! Music and vocals came through at all frequencies just at a lower db level. Worked as thought you just turned the volume down a couple of notches. Etymotic Ety-Plugs Hi-Fi Musicians Ear Plugs - Standard Size (Blue or Frost Tip)3PeterDecember 15, 2010Took my daughter to a teen concert and bought ER-20's and Hearos earplugs for $4. The cheaper ones worked better in my opinion.